What will it take for wireless charging to catch on? Nokia and Coffee Bean and Tea Leaf shops hope that making stations public will do the trick. Last September, Nokia kicked off the launch of its Nokia Lumia 920 with promises of exposing more people to wireless charging — an available, but underused capability — by bringing it to spots where people go. Specifically, Nokia said it would sponsor wireless charging stations using the Qi protocol at Virgin America airport lounges and Coffee Bean and Tea Leaf stores. Earlier this week, I finally saw Nokia’s power-promotion installed at my favorite Coffee Bean location on San Francisco’s busy Market Street. What a sorry sight it was. Market Street is a bustling downtown location, so I’m not entirely surprised that Nokia’s promotional sign is crammed in tight. Unfortunately, its image of the yellow Lumia 920 is only visible from a side angle, and almost completely obscured by customers and a table. In front of the sign, the wooden, six-seater table in question houses two towers of power outlets and sports disintegrating printed paper urging you to lay your Qi-compatible phone down right there to give it a power top-up. 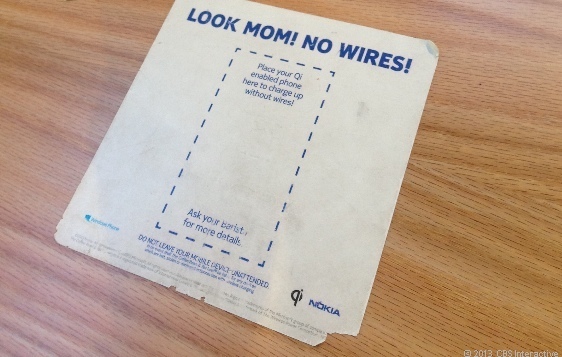 Is that smudged, disintegrating paper advertising Nokia’s under-table charging stations? Ew. Yet, there’s no charging coil within the printed sheet of paper. Peek your head under the table (which I did, much to the horror of the people seated ’round the table) to see the deep grooves and troughs where the wireless charging pads are firmly inserted and bolted down. However, why go to the effort of carving out perfect indentations if you’re only going to use decomposing and coffee-stained notices to attract users, many of whom might not know if they have a Qi-enabled phone, let alone what Qi even is. The Qi-enabled wireless chargers have been embedded beneath this work table. So with that, let me offer some advice for future in-store demonstrations. 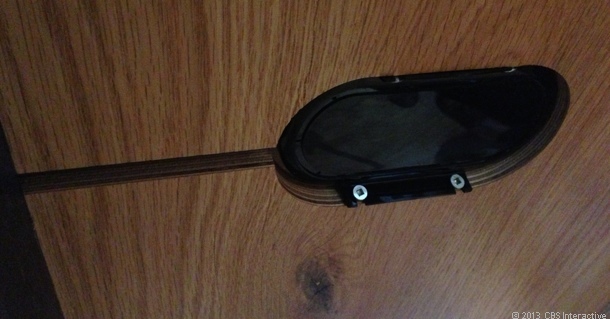 Use paint, a large vinyl sticker, or some other laminate to denote the tabletop charging area. Put some effort into its graphics and font to make wireless charging as hip and modern as it really is. 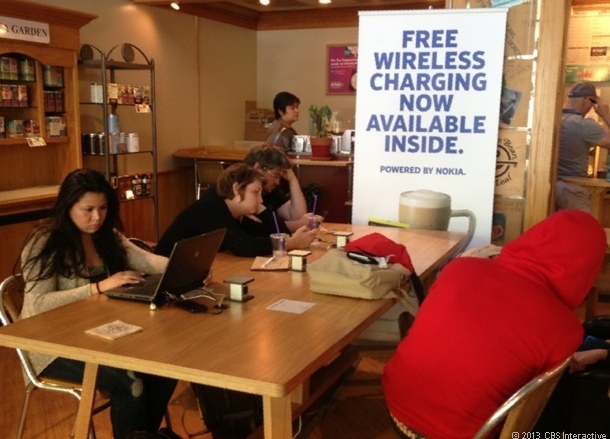 And for heaven’s sake, Nokia, or Coffee Bean, or whomever is in charge of this promotion, please do yourself a favor and have store clerks set up posters where they can do the most good promoting your actual product, the wireless charging phones you’re trying to sell.